Mackinaw City makes an ideal vacation destination! It’s located on the shores of the Straits of Mackinac, where the Great Lakes Huron and Michigan meet. Mackinaw City is rich in history and has four state parks that preserve it’s heritage. The natural beauty of Mackinaw City and Mackinac Island is sure to keep you coming back. Downtown has unique shops and restaurants. Catch a ferry to Mackinac Island for the day and then return to Mackinaw City and discover parks, beaches, shopping, restaurants, golf, concerts, and nightly laser light shows! Best Western Plus Dockside Waterfront Hotel – 505 South Huron Avenue. Lakefront rooms with private balconies. Close to Mackinaw Crossings, featuring free nightly laser show, concerts, live theater. 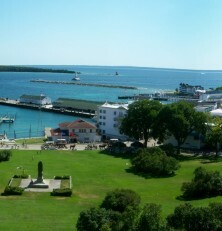 Adjacent to Mackinac Island Ferry Docks & Restaurants. Unlimited access to new waterpark across street. Hamilton Inn Select Beachfront Hotel – 701 South Huron Avenue. Mackinaw’s newest lakefront hotel directly next to the Ferry. Private sandy beach access. Close to free concerts and free laser show. Unlimited access to indoor waterpark across street. Cabins Of Mackinaw – 712 South Huron Avenue. Private cabins directly across from the Mackinac Island ferry dock. Close to shops and restaurants, Pirates Adventure Indoor Waterpark. Oversized heated indoor pool, whirlpool and sauna. Unlimited Passes to 1400 feet of private sandy beach on Lake Huron. Clarion Hotel Beachfront – 905 South Huron Avenue. Private sandy beach! Adjacent to Mackinac Island Ferry Docks. Near shops and restaurants. Lakefront rooms with private balconies. Indoor heated pool & whirlpool. Excellent view of Mackinac Island and Mackinac Bridge! Admiral’s Table Restaurant – 502 South Huron Avenue. Casual dining featuring Great Lakes fish, seafood, prime rib, and steaks. Across from the boat docks. Anna’s Country Buffet – 416 South Huron Avenue. Largest buffet in Mackinaw City. Open for breakfast, lunch and dinner daily. Browse their gift shop and specialty food store. Dixie Saloon – 401 East Central Avenue. A Mackinaw City Tradition since 1890. Famous Dixie BBQ Ribs and steaks. Located across from Shepler’s Mackinac Island Ferry, at the corner of Huron and Central. Mackinaw Bakery and Coffeehouse – 110 Langlade Street. Homemade baked goods. Birthday cakes, old fashioned salt rising breads, ice cream cones, cappuccino, coffee and pasties baked fresh daily. O’reillys Irish Pub and Restaurant – 401 East Central Street. Mackinaw’s only Irish Pub. Burgers, fresh fish, and rotisserie chicken. Nightly Entertainment. Across from Shepler’s Ferry, Located behind the Dixie Saloon. Animal Tracks Adventure Golf – 220 South Huron Avenue. Learn about Northern Michigan wildlife while playing in a scenic environment with crashing waterfalls and rock bridges! Carriage Tours – Mackinac Island. Since motor vehicles are not permitted on Mackinac Island, there is no better way to visit this historic isle and see the legendary points of interest than by carriage. Fort Mackinac – Mackinac Island. Accurately, professionally restored 18th and 19th century British and U.S. military outpost with 14 original historic buildings. Historic Downtown Mackinac Island. Once the hub of the bustling fur trade, Mackinac Island served as a commercial depot for half a century of fur trappers and traders. Shepler’s Mackinac Island Ferry – Mackinaw City. Your Gateway to Mackinaw Island. Shepler’s clean, comfortable passenger ferries zip you safely to Mackinac Island in just 16 minutes! And don’t forget about shopping! Mackinaw City is well known for it’s downtown shopping district. There are so many options all around. Spend the day discovering the many quaint shops and unique gifts. Interstate 75 runs north-south and is the main access to Mackinaw City. Huron Avenue is the areas main thoroughfare and runs roughly along the shoreline. Three ferry companies operate out of Mackinaw City, connecting tourists and commuters to Mackinac Island. Several rail lines provided passenger traffic to the area on trains such as the Northern Arrow to Mackinaw City.The nearest airports with scheduled passenger service are in Pellston Regional Airport, Traverse City Cherry Capital Airport and Alpena County Regional Airport in the Lower peninsula and Chippewa County International Airport in Sault Ste. Marie.